The December 2010 Carmel Forest Fire was the worst natural disaster in Israel’s history, claiming 44 lives, burning more than five million trees, and destroying nearly 300 homes and buildings. 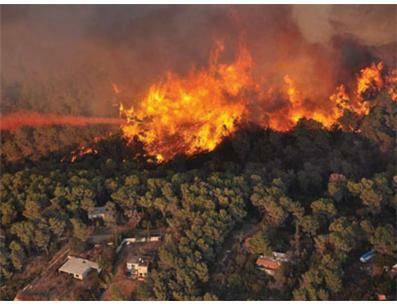 This devastating blaze highlighted an urgent need within Israel’s Fire and Rescue Services for improved safety equipment specially designed for forest fire conditions. The cost to outfit one firefighter with state-of-the-art forest fire protective gear and a personal fire shelter is $2,000. Jewish National Fund (JNF) and Friends of Israel Firefighters (FIF) are raising funds to purchase these much needed supplies through the Operation Carmel Renewal campaign. Please help us support the men and women of the Israeli Fire and Rescue Services and ensure that these courageous first responders are adequately protected. Forest Fire SUIT Firefighters on the scene of a forest fire face very different conditions than those responding to urban fires, and their protective suits must be adapted accordingly. Exposed to the elements and the hot sun, they engage in physically demanding activities like digging, chopping, and shoveling that cause them to overheat very quickly. They wear long pants under their gear for added protection, which also raises their body temperature. To top it off, forest fires tend to last longer than urban fires. Forest fire jackets and pants are lighter than traditional firefighting protective gear to allow for greater mobility, and their unique insulation keeps firefighters cool by allowing body heat to escape. Knee, elbow, and shoulder areas can be reinforced for additional protection and durability. Fire Shelter The personal fire shelter is a last resort life-saving measure employed when planned escape routes or safety zones become inadequate and entrapment is imminent. Essential for firefighting in forest-like environments, the shelter— which folds into a pouch on the firefighting suit—is designed to reflect radiant heat, protect against convective heat, and trap breathable air, a critical feature since most firefighting deaths are caused by gas inhalation. The shelter’s outer layer is made of aluminum foil (which reflects radiant heat) bonded to woven silica cloth (responsible for slowing the passage of heat to the inside of the shelter). An inner layer of aluminum foil laminated onto fiberglass prevents heat from re-radiating to the person inside the shelter. When deployed, the moundshaped shelter’s dimensions are 86” x 15.5” x 31”. Donations of $2,000 will completely outfit one firefighter with advanced protective firefighting clothing that meets today’s stringent safety standards. Donors will receive a framed certificate, a personal letter and photograph from the “adopted” firefighter, and an invitation to visit the firefighter at their fire station in Israel. The cost to outfit one firefighter with state-of-the-art forest fire protective gear and a personal fire shelter is $2,000.